It wouldn’t exactly surprise you if I said that I love eggs. Eggs are pretty much at the top of my list of favorite foods, along with Chobani Greek Yogurt and filet mignon. If I could combine those into one meal, I’d be a happy man. Last month I was reading a post by Eric Cressey, where he reviews Dave Ruel’s Metabolic Cooking. 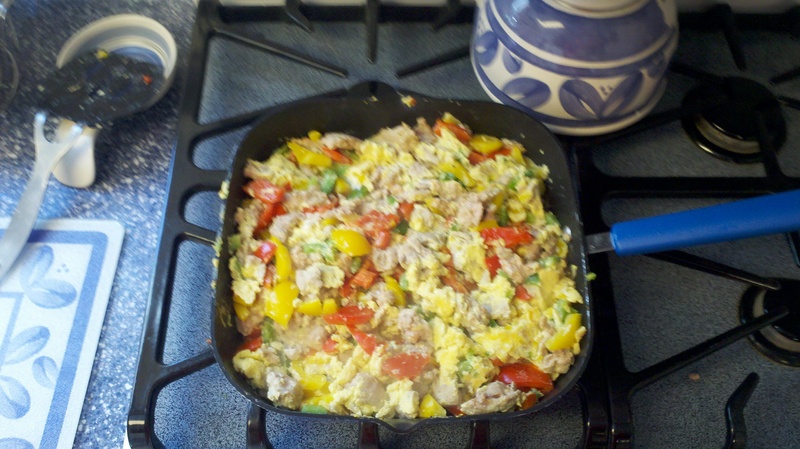 In it, he references a “Mexi Turkey-Eggs Skillet” recipe that he uses with left over ground turkey. Curious as always, I went on a culinary quest to recreate this meal based on the picture Eric used. Not only is that list orderly, but the post got a little bit longer. Great! Now, let’s get to how I made this delicacy, then I’ll unveil a picture of my gourmet delicacy. Step One: Cook ground turkey. I coated the pan, the broke the turkey into smaller bits and cracked some pepper on to it.. I left the heat on medium low, so I would have plenty of time to complete Step Two, which involved me cutting up the peppers. I’ve never had to do this before, so it took a little longer than it should have, but I figured it all out. After I cut the peppers, I stirred the turkey/pepper mix around so the flavors could mix. After letting the mix cook for 5 minutes, I added 6 beaten eggs. Again, I stirred the mixture around, then let it cook for 8 minutes, stirring every minute. After this time, I turned off the burner, pulled at plates, and served some for my mom and myself. If she bought the ingredients, I should let her try it out, right? Thanks, Mom.